We had heard that Huawei was going to shock the world (or at least impressionable gadget lovers) with an enormous smartphone, and they've made it official here at CES. The Ascend Mate is real, it's got a 6.1-inch screen, and it will be coming to China in February. That monster panel is a 720p IPS LCD - strangely, a lower resolution than the new 5-inch Ascend D2 - and gives the device a 73% screen-to-body ratio. Something called Magic Touch, which Huawei isn't elaborating on in the press materials, will make the screen work through gloves. Interestingly, there doesn't seem to be a stylus included. The Ascend Mate runs Android 4.1 on a 1.5Ghz dual-core processor, but RAM and storage capacity haven't been mentioned just yet. A massive 4050mAh battery should run this thing for up to two days of regular usage. Sadly typical 8MP and 1MP cameras on the rear and front, respectively, will keep it out of the same league as the Ascend D2. Huawei may be positioning the Mate at a lower price point, despite its larger screen and thinner 6.5mm build. In addition to Huawei's interface customizations, they're throwing in custom-made apps, the most interesting of which is an augmented reality navigation app. There's no mention of a release outside of China, but with all the excitement around the larger form factors lately, it's entirely possible that carriers in the U.S. and elsewhere could be interested. 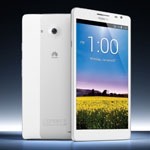 LAS VEGAS, Jan. 7, 2013 /PRNewswire/ -- Huawei, a leading global information and communications technology (ICT) solutions provider, today launched the smartphone with the largest screen in the world, the HUAWEI Ascend Mate, at the 2013 Consumer Electronics Show (CES). The HUAWEI Ascend Mate features a huge 6.1-inch HD display, a 1.5 GHz Hi-Silicon quad-core processor and a 4050 mAh battery. Together with Huawei's proprietary Quick Power Control (QPC) and Automated Discontinuous Reception (ADRX) battery efficiency technology and fast sharing technology, the HUAWEI Ascend Mate is proof that bigger is better. HUAWEI Ascend Mate has a screen-to-body ratio of 73 percent – the highest in the industry – which maximizes your viewing pleasure for emails, documents, video or games. The 6.1-inch HD IPS+ LCD screen has a resolution of 1280 x 720 for unsurpassed clarity and color accuracy, and 'Magic Touch' which provides enhanced screen responsiveness even with gloves. The Ascend Mate is slim and stylish, designed to fit comfortably in a single hand at just 6.5mm thin at its narrowest part. 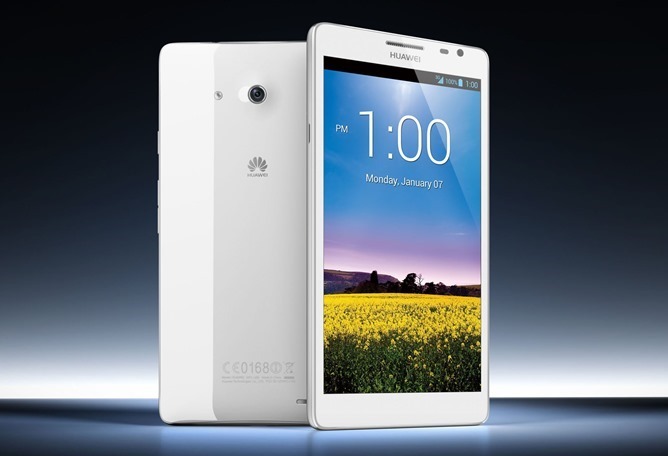 HUAWEI Ascend Mate features a 4050 mAh battery and Huawei's Hi-Silicon 1.5 GHz quad-core processor. With Huawei's QPC and ADRX smart power-saving technology, the smartphone provides up to two days of ordinary usage on a single charge. It has the fastest battery charging capability of smartphones in its range, which saves over 30 percent of battery charging time. Together with global roaming functionality, the HUAWEI Ascend Mate supports five frequency bands making this smartphone perfect for international travelers. Its dual-antenna design supports high power data transmission and is optimized with maximum ratio combining method, to increase network reception by up to 2.5dB and providing an increase of 20 to 30 percent of overall network coverage.